he big news surrounding the Site Selection Governor's Cup facilities race for 2000 is the fact that the big winners -- Michigan and Detroit -- are getting quite comfortable taking their respective rides down victory lane. For the fourth year in a row, the state of Michigan claimed the top spot in the magazine's competition for most new and expanded corporate facilities in the United States. And unlike last year, this time the race wasn't even close. 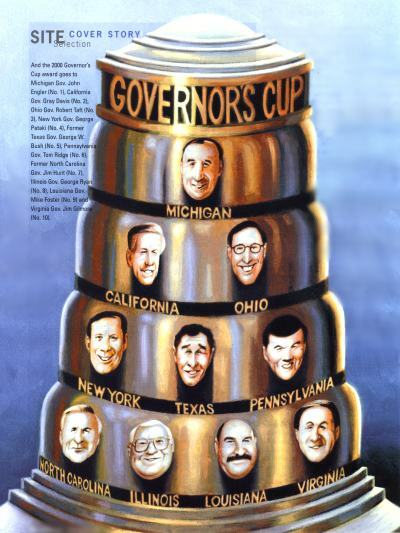 With 2,358 new and expanded facilities as defined by the criteria established by Site Selection magazine (see the explanation of our methodology) during calendar year 2000, Michigan emerged as the undisputed champion of the Governor's Cup competition for a record four consecutive years. The amazing streak even surpassed Ohio's incredible three-year run from 1993 to 1995. Michigan's dominance was evident in several key areas, most notably in its lopsided victory over runner-up California, which concluded the 2000 campaign with 1,351 new and expanded facilities. For the Golden State, that was good enough for a second straight finish at No. 2. Michigan's strength was also seen in the fact that it produced the top metro area -- Detroit -- for the fourth consecutive year. The Motor City, with 1,163 new and expanded corporate facilities, easily outdistanced runner-up Chicago, which had 407. The remainder of the top 10 states, following Michigan and California, were Ohio (1,129), New York (1,121), Texas (642), Pennsylvania (632), North Carolina (597), Illinois (558), Louisiana (436) and Virginia (370). Top Small Towns: With 127 total new and expanded facilities over the past 12 years, Statesville, N.C., easily defended its 1999 ranking as America's top small town for corporate facilities. Site Selection's annual ranking, which lists the top 100 small towns in America for expansion activity, includes 22 Ohio towns and 18 towns in North Carolina. The top 10 small towns for 2000, following Statesville, were as follows: Bowling Green, Ky., with 103 facilities from 1989 through 2000; Mooresville, N.C. (93); Findlay, Ohio (78); Plattsburgh, N.Y. (70); Sanford, N.C. (68); Traverse City, Mich. (67); Tupelo, Miss. (64); Danville, Ill. (63); and Plaquemine, La. (63). Proportional Rankings: Virginia may rank 10th in total new and expanded corporate facilities for 2000, but the Old Dominion's plant expansion activity is generating more jobs per capita than any other state in the nation. From 1998 through 2000, Virginia's new plants and expansions generated 23,523 jobs per 1 million state residents. Kentucky ranked No. 2, generating 18,234 jobs per 1 million population. The remainder of the top 10 states in jobs per million people were, in order, Michigan, New York, South Carolina, West Virginia, North Carolina, Texas, Pennsylvania and North Dakota. In the other three proportional rankings, however, Michigan once again asserted its dominance. Michigan scored first in the total number of new and expanded facilities per 1 million population and first in the total number of new and expanded facilities per 1,000 sq. miles. Michigan tallied 655 facilities per 1 million people and 110 facilities per 1,000 sq. miles. Michigan also won the competition for capital investment per 1 million residents. The state generated US$5.28 billion in capital investment in new facilities per million people. New Manufacturing Plants: While Michigan secured the top spot in the total number of new manufacturing plants in 2000, with 282, California was not far behind, tallying 238. Also generating a high number of new manufacturing plants last year were third-place Ohio (206), followed by Pennsylvania (126), New York (117), Illinois (113), North Carolina (97), Texas (71), Louisiana (68), Minnesota and Alabama (both with 55). In terms of consistency over time, however, California is the clear leader in producing new manufacturing facilities. For the most recent three-year period (1998-2000), the Golden State topped the charts with 980 new manufacturing projects, more than 100 ahead of second-place Ohio, which had 863. Rounding out the top 10 states in this category were Michigan (805), North Carolina (346), Illinois (343), Texas (319), New York (280), Pennsylvania (264), Minnesota (184) and Virginia (169). Top Global Facilities: If you're looking for a trend among the largest internationally based corporate real estate projects, look no further than the Far East. Of the 20 largest global facilities in terms of capital investment last year, 10 were in China, Taiwan or Japan. The largest global project in 2000 was a $3.1 billion Bayer project in Caojing, China. Ranking No. 2 was a $2.5 billion Mosel Vitelic wafer-fabrication plant in Montreal, followed by a $2 billion Intel expansion project in Dublin, Ireland.